This set includes a California King Mattress with 2 split Cal King adjustable bases which can be synchronized to work together. This set is also available with split Cal King mattresses for individual adjustment. 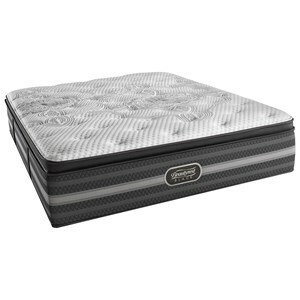 The Beautyrest Black Katarina Cal King Luxury Firm Pillow Top Mattress and SmartMotion? 3.0 Adjustable Base by Simmons at Hudson's Furniture in the Tampa, St Petersburg, Orlando, Ormond Beach & Sarasota Florida area. Product availability may vary. Contact us for the most current availability on this product. 700730103-1070 Cal King Lux Firm P.T. Mattress 1 15"